Shorten your shifter's throw by 50% and experience more accurate, crisper shifts by installing our short shift kit. 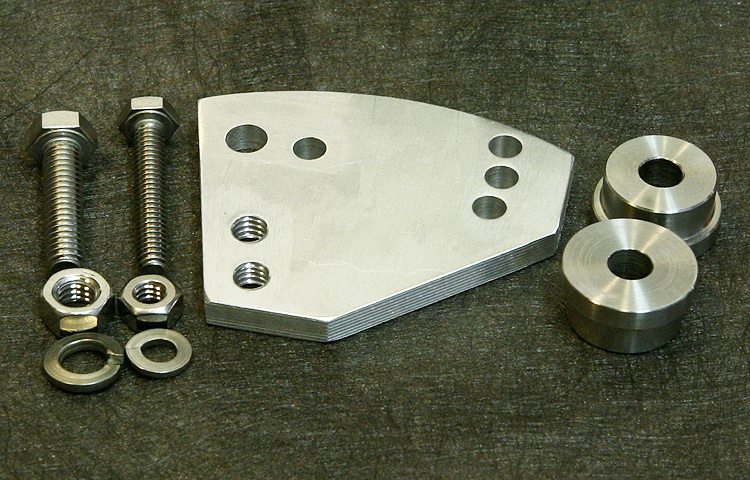 The kit features a plate milled from aircraft-grade aluminum and includes stainless steel mounting hardware. The plate mounts on the stock shifter bracket (on top of the transmission), and the stainless-steel bushings replace the mushy rubber bushings on the shifter cable ends. The short shift plate comes with 3 positions that adjust the front-to-back position of the shift knob. This allows you to personalize the location of the shift knob. It can be set centered, slightly forward (for a longer reach), or slightly back (for a shorter reach). There are also two positions to shorten the throw; short or even shorter. This is the perfect low-cost modification to maximize the enjoyment of your standard transmission and a great add-on if you have done a manual swap on your North American spec turbo 850. You can install this kit with hand tools and a drill. Installation typically takes 1.5 hours. * Designed for Volvo's front wheels drive m56l, m56h and m59 transmissions. * 1993-97 Volvo 850 with 5 speed manual transmission. International orders welcome! International Group buys can make shipping very reasonable, please contact me for details. Installation was simple and under 30 minutes. I have been running this for 6 months now and it is still performing excellent. Best upgrade I have made for the money.